The developers of PlayerUnknown’s Battlegrounds have added a Custom Match feature to the game. The feature is currently in open beta, with the number of concurrent matches limited to ten thousand. Custom Match allows you a large amount of freedom to customize many different aspects of a match. The only drawback is that they might start charging for it later on. PlayerUnknown’s Battlegrounds is now offering a new feature that will certainly peak the interest of many players. 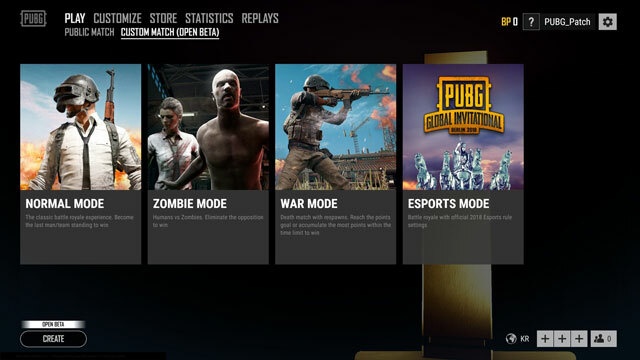 The feature in question is the Custom Match, which is now in the open beta stage. It allows you to, well, make your own matches, and also leaf through matches already created. According to the announcement on Steam, from circle behavior, you can switch up a lot of stuff, including “item/vehicle spawn rates, to loadouts and more.” You even get to choose which mode you want to play, including Normal and Zombie And, you can make the matches public or private. Just keep in mind that, during the open beta stage, the number of concurrent custom games will be limited to ten thousand, which is still pretty good. The first step is to select the mode you want. Then, the game will take you to a list of already created matches, with some basic details, that you can peruse through. If you want to create your own, the game will present you with the default preset. From there, you can change a bunch of different settings. And, if you want to keep the match private, you’ll have to set the password, which you can then share with others. All of this sounds great. There is just one potential problem. Right now, the Custom Matches cost nothing. Then, however, we learn that “due to the extremely large amount of resources required to allow custom games to be available to all players, we may change this in the future to ensure everything runs smoothly and the system remains sustainable long-term.” They do point out that they’re open to feedback on this, but still, that’s bound to displease some people.